Acupuncture in the Treatment of Premature Ovarian Failure… Premature ovarian failure is the loss of ovarian function before the age of 40. Women of reproductive age, from teens to late 30s, can be affected with this condition, and it is a leading cause for female infertility. Premature ovarian failure (POF) is often called premature menopause, but it is different from menopause in a number of ways. First, some women with OF can conceive naturally, whereas menopause means you can never get pregnant again. Second, menopause occurs naturally with age, while POF is not something that should occur in young women in their reproductive prime. By the age of 40, at least one percent of women suffer from POF. If you are suffering from POF, and want to correct that problem, or want to improve your chances of pregnancy; we urge you to consider acupuncture as a safe and healthy method of fixing your condition. Menopause means that all period cycles will end, but women with POF continue to menstruate, just on a more irregular basis. Different women will experience different symptoms; and in many cases, POF symptoms are more intense than actual menopause symptoms. Usually, when Ovaries start to fail and lose function, there is an estrogen deficiency in the body, which is what causes all the menopause-like symptoms. These are usually corrected by giving additional hormonal supplements. The other conditions like Osteoporosis and heart disease are managed like they would be in any other patient, with the use of additional medication. Hormones are not a safe or practical solution, as they may temporarily fix the issue, but there will be a need for a lifelong dependency on them. Altering your hormonal make-up can also have adverse side-effects that will harm you in the long run. Administering pills and chemicals of other kinds will do nothing but increase the toxic levels of your body, creating an unhealthy environment for you and your future baby. 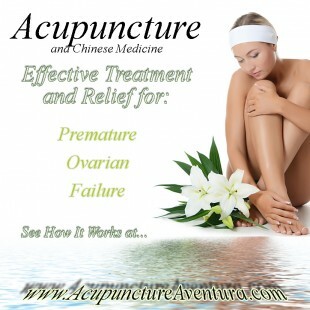 This is why more and more women are opting for alternative medicine in the form of acupuncture therapy for treating POF. When compared to chemical or surgical intervention, acupuncture is a safe, healthy, and non-invasive method for effectively treating your condition. Acupuncture allows for energy to pass the main meridians and pathways of the body, allowing it to release endorphins and other hormones associated with healing. It also allows for blood circulation, which (according to Traditional Chinese Medicine) is essential for helping you maintain a regular period. TCM believes that energy, or qi, passes through the body, and that blood is the physical manifestation of qi. When the qi is being blocked, there is a problem. Once your period returns, your ovaries will start functioning better, allowing for better chances of conception. Studies have shown that acupuncture treatment for POF leads to better functioning of the ovaries, and increased likelihood of pregnancy. All this without polluting your body with unnecessary chemicals. At our center in Aventura Florida, Dr. Andrea firmly believes that eastern holistic minded medicine will help you achieve your goals. Acupuncture therapy has no adverse affects for your body, and can help maintain perfect reproductive health. To make an appointment, call us at (786) 537-7022 and we can begin your treatment immediately.